Now Linksys EA-Series, E-Series, X-Series and Valet router users have more flexibility than ever before to manage and view network information in real time from anywhere in the home. 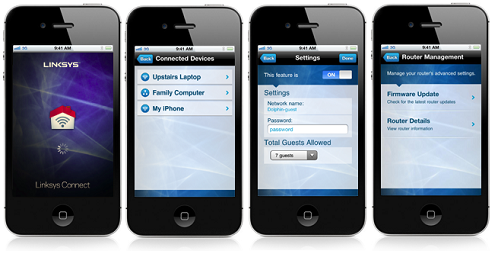 For quick access to common Linksys Connect features and your network information, download the FREE Linksys Connect mobile app*. Easy guest access – An easy way for your visitors to get online. Give password-protected internet access to visiting friends and family while keeping your own information private. Add devices – Quickly see what devices are connected to the home network and add new devices. You can add them manually or with Wi-Fi Protected Setup™ if your device supports it. View Wi-Fi settings – Easily see and edit the current Wi-Fi name and password at anytime from anywhere in your home. Manage your router – Access your common router features, such as rebooting the router, getting a new WAN IP address, checking for firmware updates, and viewing router details such as name, model, serial number, firmware in use, and more. Where to get the app – Download the FREE Linksys Connect mobile app from the App Store® and Google Play™. Also, click here to find out if your device is compatible with the app. *Requires an active Wi-Fi connection to your Linksys E-Series, X-Series or Valet home router.